Ive used this for a year and it really does help me to feel better and sleep better. 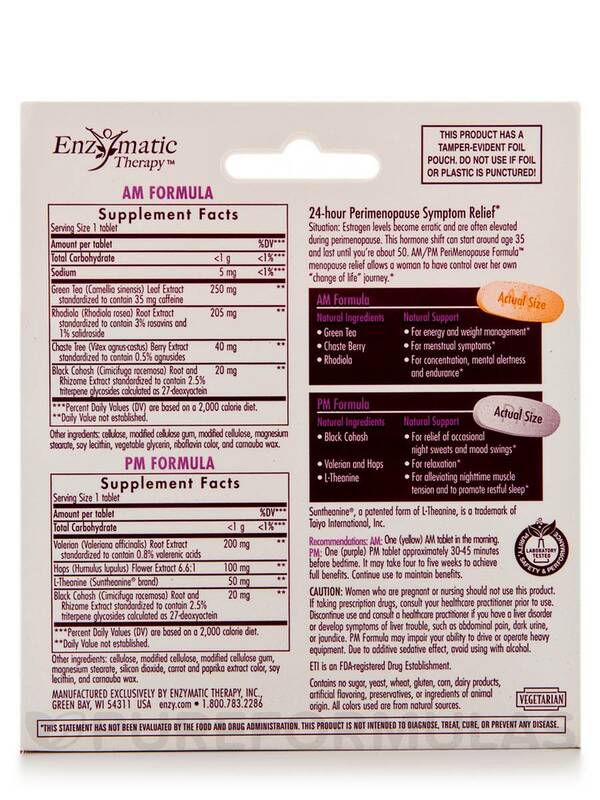 AM/PM PeriMenopause Formula by Enzymatic Therapy may possibly help relieve symptoms of perimenopause naturally. It’s made to possibly help women enter perimenopause with fewer symptoms. Green Tea (Camellia Sinensis): Polyphenols present in green tea may possibly inhibit the growth of harmful cells in the breast. It’s believed to help lessen anxiety. Rhodiola (Rhodiola Rosea) Root Extract: Might potentially help boost the body’s energy level and fight anxiety. Chaste Tree (Vitex Agnus-Castus) Berry Extract: May possibly help promote healthy progesterone levels. Black Cohosh (Cimicifuga Racemosa) Root: Could have potential benefits in supporting women’s hormone-related symptoms. Rhizome Extract: It’s believed to help promote a healthy immune system. 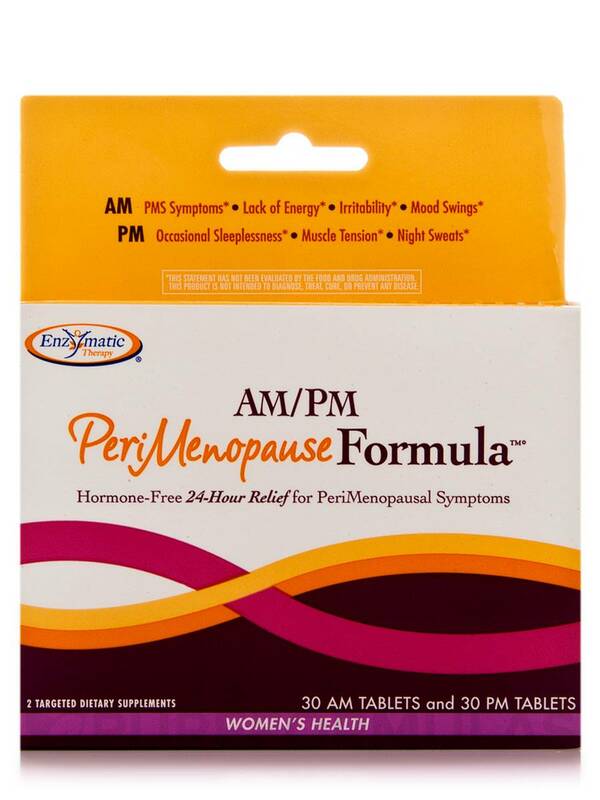 Enzymatic Therapy’s AM/PM PeriMenopause Formula may possibly help reduce anxiety overall. All colors used are from natural sources. **Based on 2000 calorie diet.Other Ingredients: AM FORMULA: cellulose‚ modified cellulose gum‚ modified cellulose‚ magnesium stearate‚ soy lecithin‚ vegetable glycerin‚ riboflavin color‚ and carnauba wax. PM FORMULA: cellulose‚ modified cellulose‚ modified cellulose gum‚ magnesium stearate‚ silicon dioxide‚ carrot and paprika extract color‚ soy lecithin‚ and carnauba wax. PM: One (purple) PM tablet approximately 30-45 minutes before bedtime. It may take four to five weeks to achieve full benefits. Continue use to maintain benefits. Women who are pregnant or nursing should not use this product. If taking prescription drugs‚ consult your healthcare practitioner prior to use. Discontinue use and consult a healthcare practitioner if you have a liver disorder or develop symptoms of liver trouble‚ such as abdominal pain‚ dark urine‚ or jaundice. PM Formula may impair your ability to drive or operate heavy equipment. Due to additive sedative effect‚ avoid using with alcohol.